The top that was meant to be a dress. As much as I like how this top turned out, it was the result of a mistake that I saved. 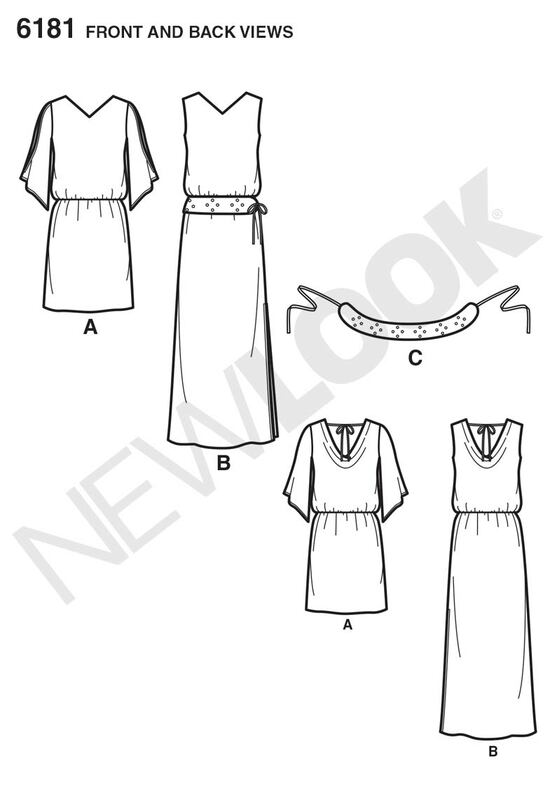 As the line drawing of view A illustrates, the dress has a v-neckline, loose “blouson” fitting bodice, a two-piece sleeve with an open seam, and short skirt. 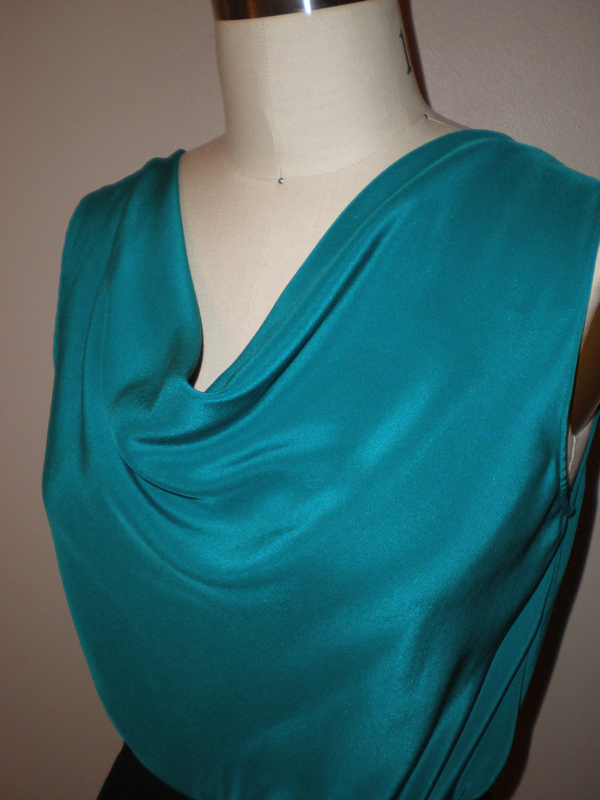 It also has a lovely cowl-draped back. 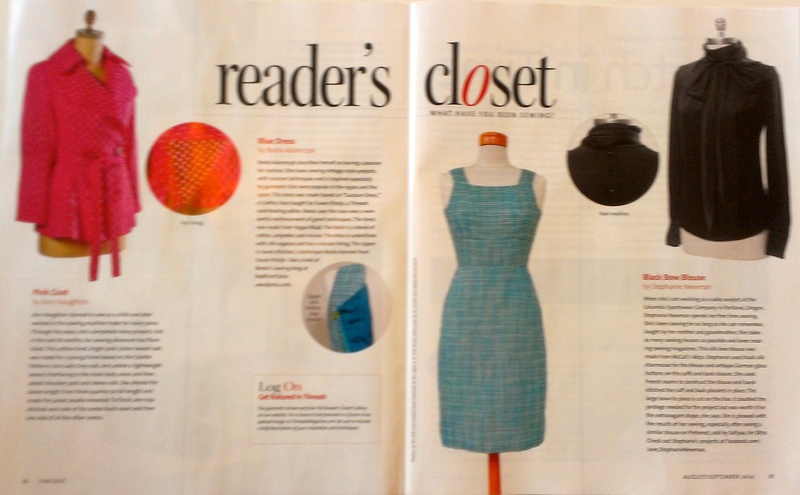 The back is the nicest part of this pattern and really should be featured on the cover of the pattern. 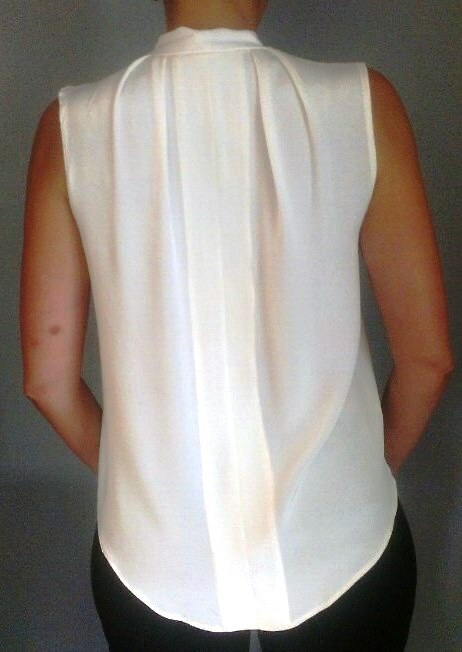 The back is so nice in my opinion, that it could be worn as the front for a face-flattering draped cowl neck. 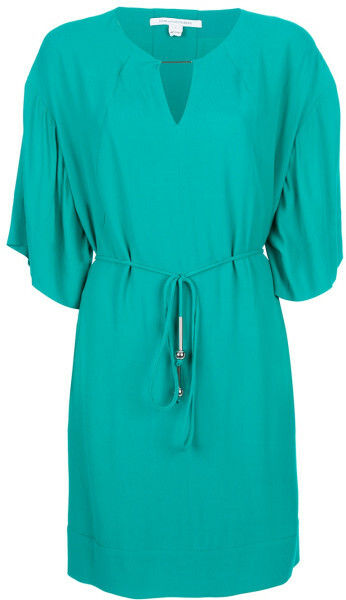 The short dress, view A with modifications, is the intended dress. 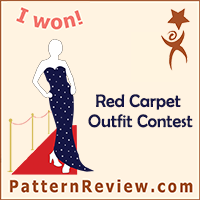 I wanted a fast, easy, pretty and comfortable silk dress to wear, so I bought this pattern. 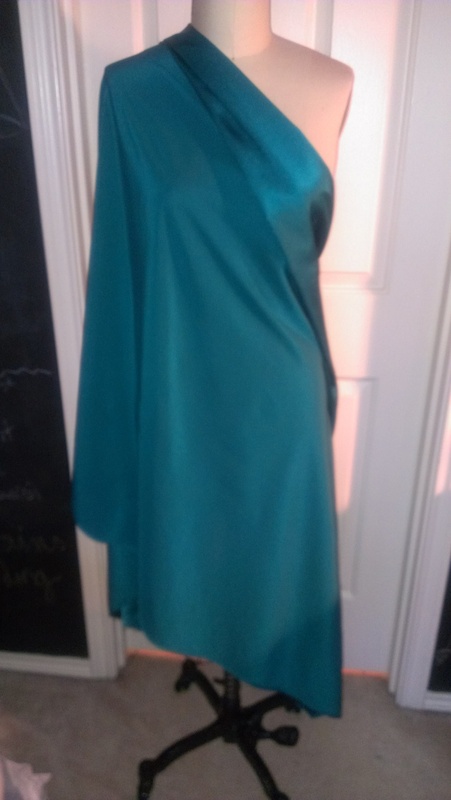 I had some of this lovely teal green silk charmeuse in my stash I bought at Josephine’s Dry Goods last year. 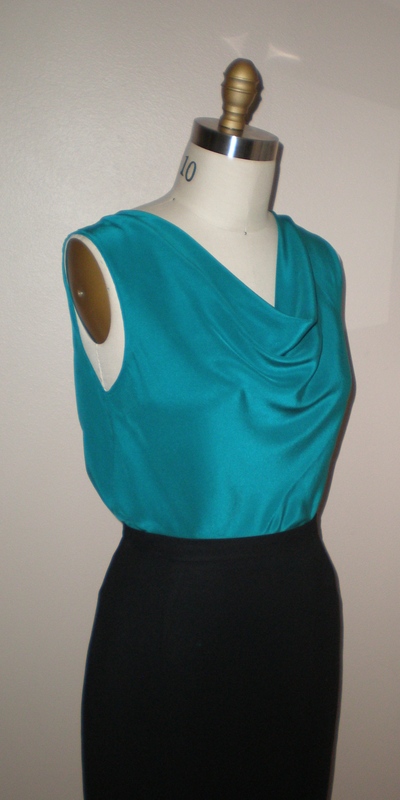 Silk fabric draped on dress form. 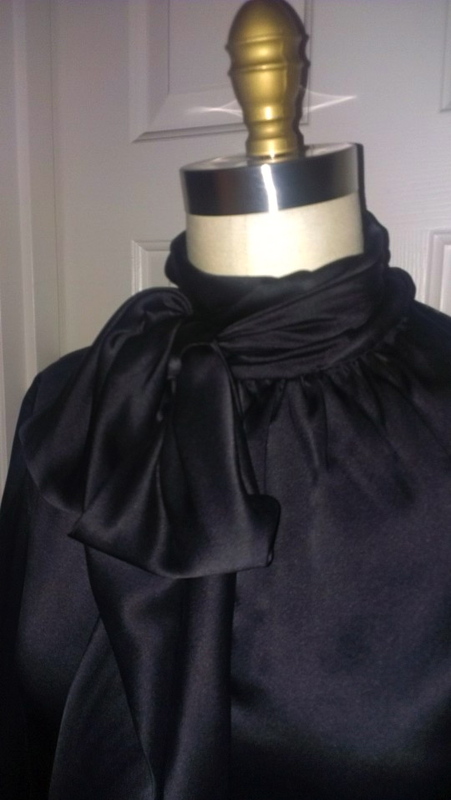 I decided to modify the front of the neckline of the pattern to a more curved shape to compliment the curved and draped cowl back neckline. I thought this would look better than a V-neck for this dress. 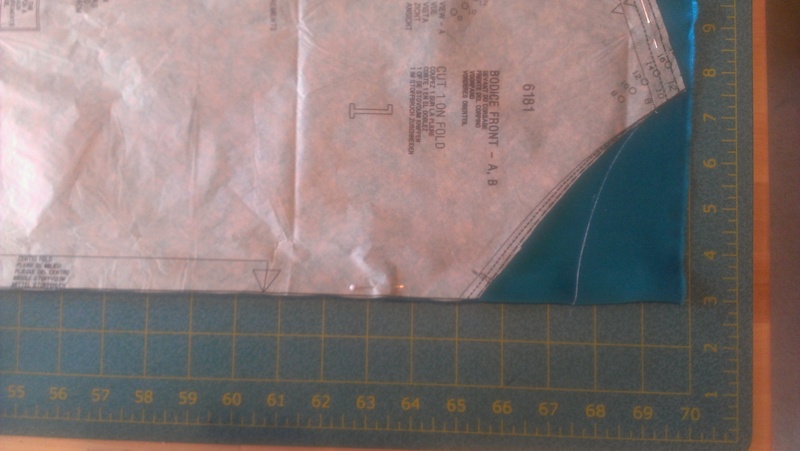 So, as I was cutting out the pattern, using chalk and a curved ruler, I just drew a new front neckline right onto my fabric. 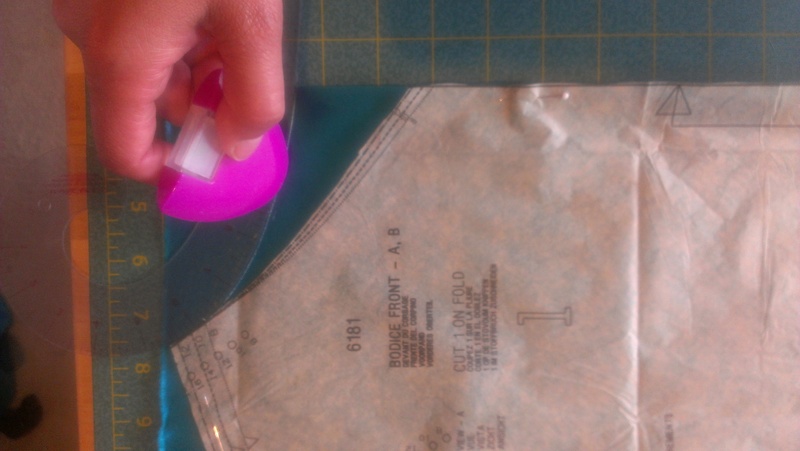 Drawing in new curved neckline using my chalk tool and curved ruler. 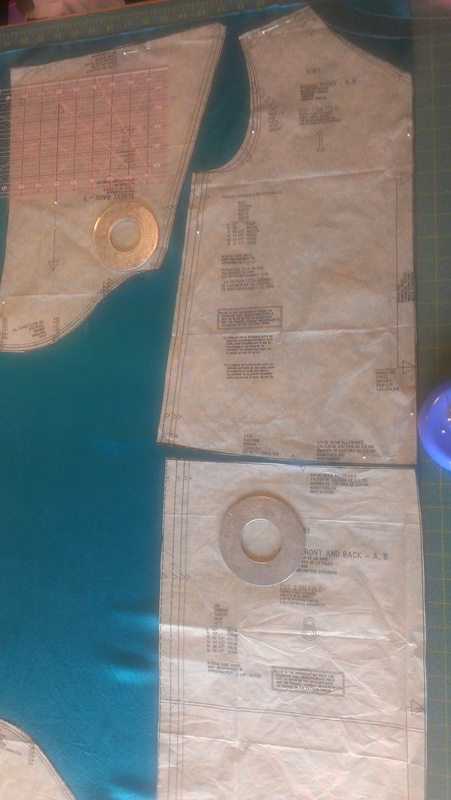 So, plugging along, I cut out all of my pattern pieces including the front bodice, the back bodice, the skirt and the sleeves. That went pretty well…. The cutting out and marking process was (pleasantly) surprisingly fast! Everything was going well until I was ready to sew and realized I left out a major part: I only have the front part of the skirt! I cut one skirt piece on the fold, not realizing I need two skirt pieces! ARGH!!! I did not have enough extra fabric to cut out the rest of the skirt, so the whole dress idea had to be scrapped and re-thought. 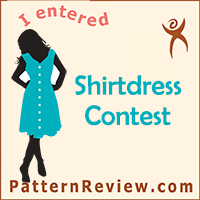 I figured I would continue sewing the top of the dress and see how it went as just a top. I finished most of the work in about 2 hours, eliminating the back sting tie, the front neck facings and the sleeves. 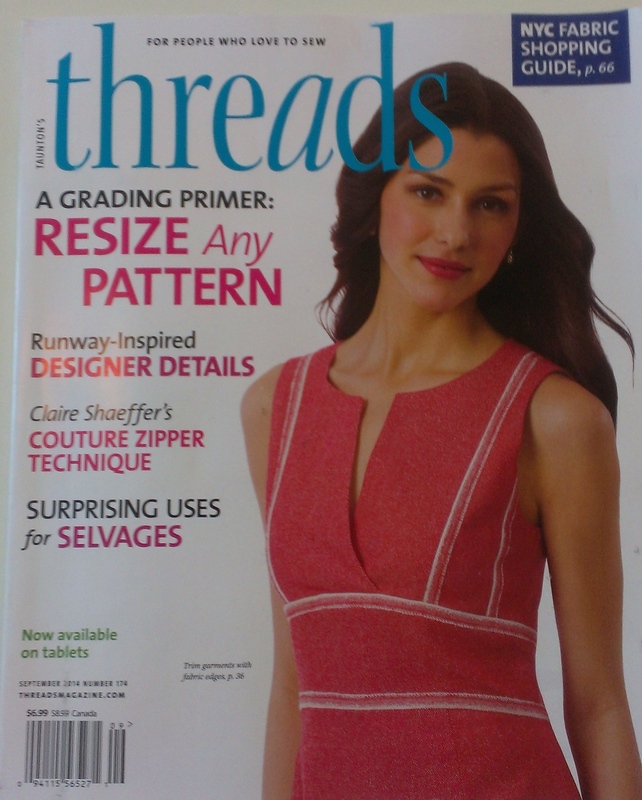 I cut two bias strips from the scraps of fabric for the arm holes and finished the neckline and bottom with a narrow hem. 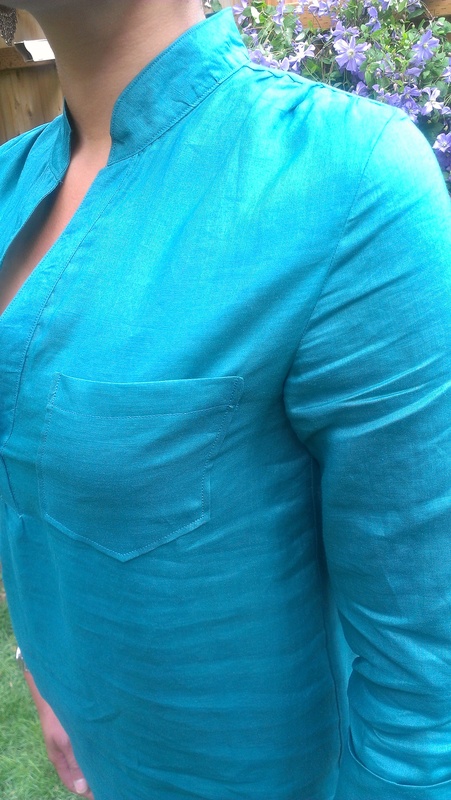 rounded front neckline of silk top. 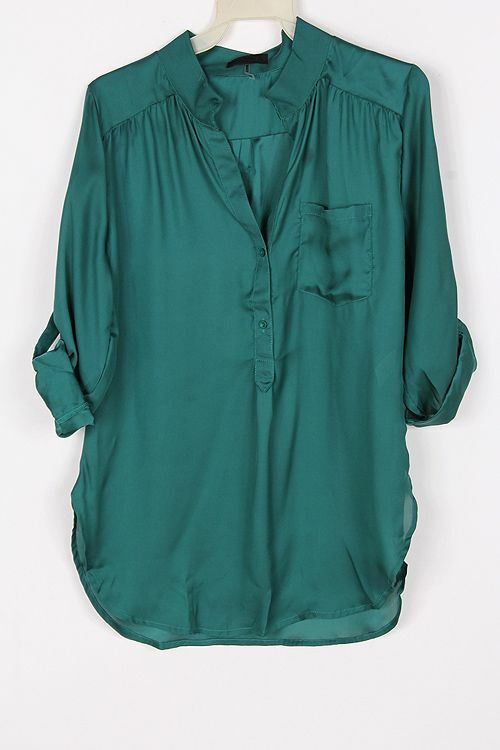 Worn tucked in looks nice with a skirt or pant. 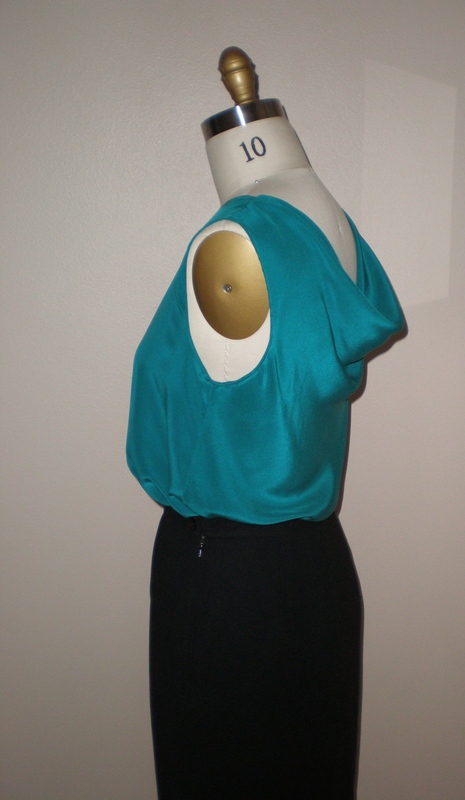 Top turned backwards, worn with cowl drape in front. 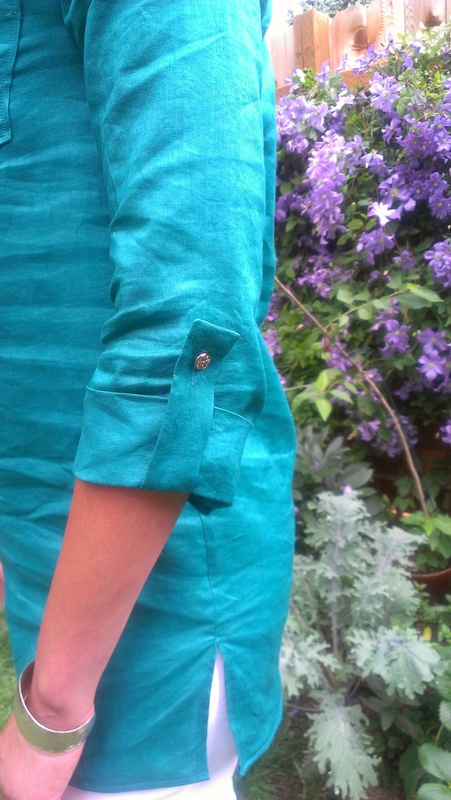 Overall, I am pleased with my new silk top, and chalk this up to a wearable mistake and practice for the dress version! 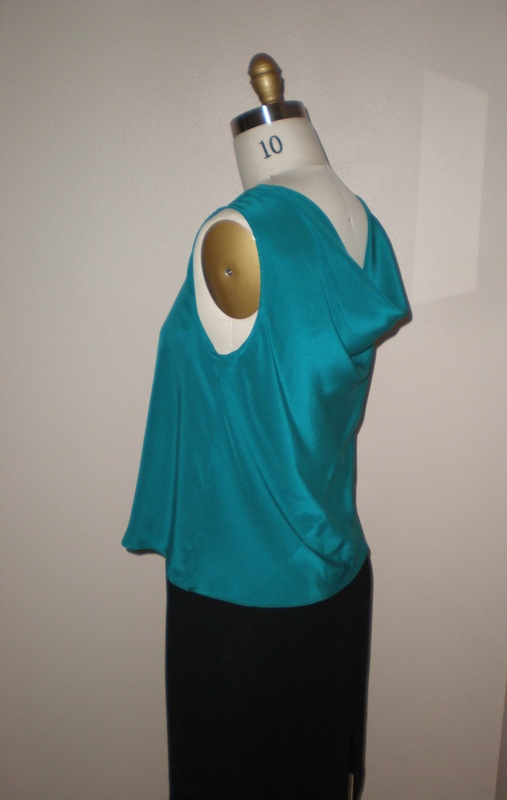 The top has a lovely drape, can be worn frontwards or backwards, and is a beautiful color of teal green. 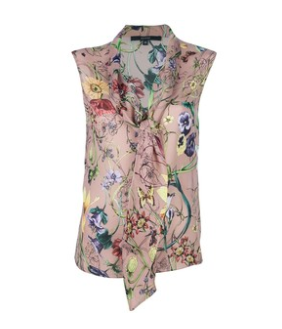 I decided that I need more silk blouses and tops in my wardrobe (one can never have enough of them, right!) and had a smallish piece (1.3 yards) of beautifully soft and drapey silk crepe de chine on hand that I purchased at Mill End Store in Milwaukie, Oregon. 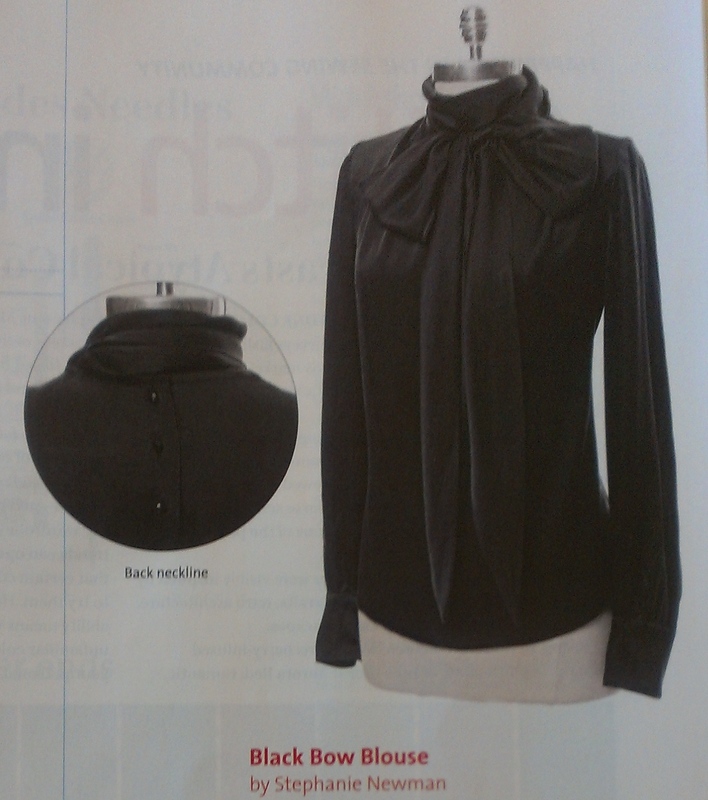 So, I decided to make Simplicity 1661 pattern again, as I really like my black silk charmeuse version that I made last year and wear it often. I managed to fit (just barely!) 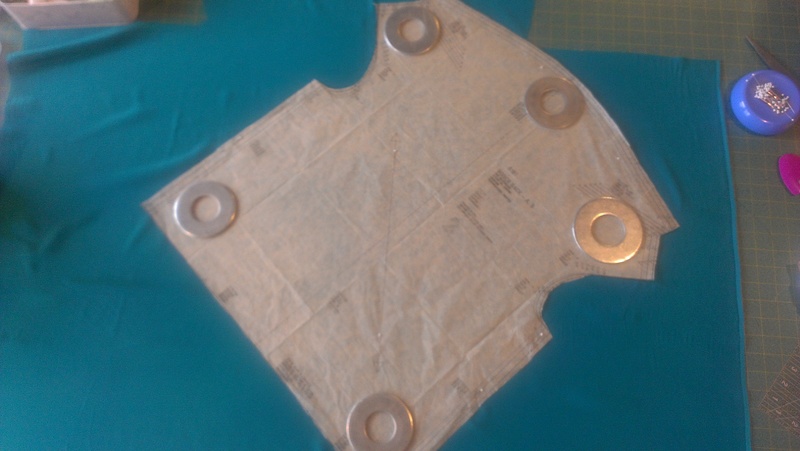 all of the pattern pieces on the small fabric piece and cut them out with my sharp rotary cutter pretty quickly. 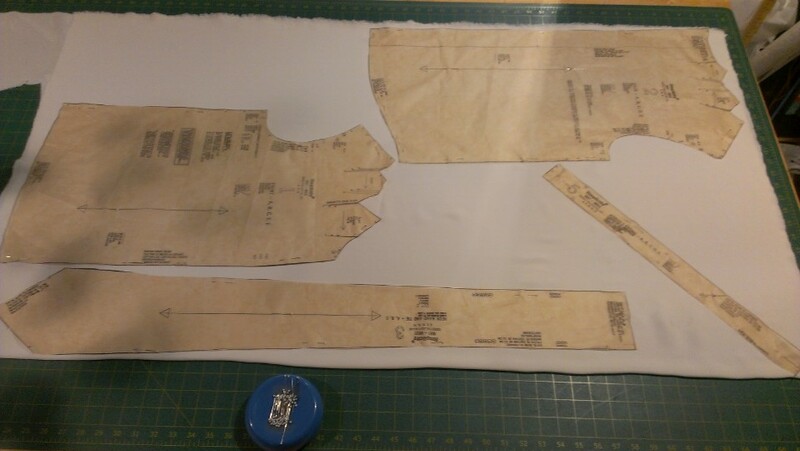 I hate this part of the sewing process as it needs to be precise and can be time-consuming making all of the markings for pleats, notches and such. 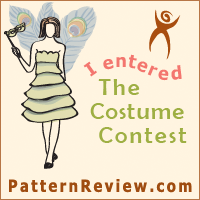 This top only has a few pattern pieces so it went fairly quickly and I could get to sewing faster. 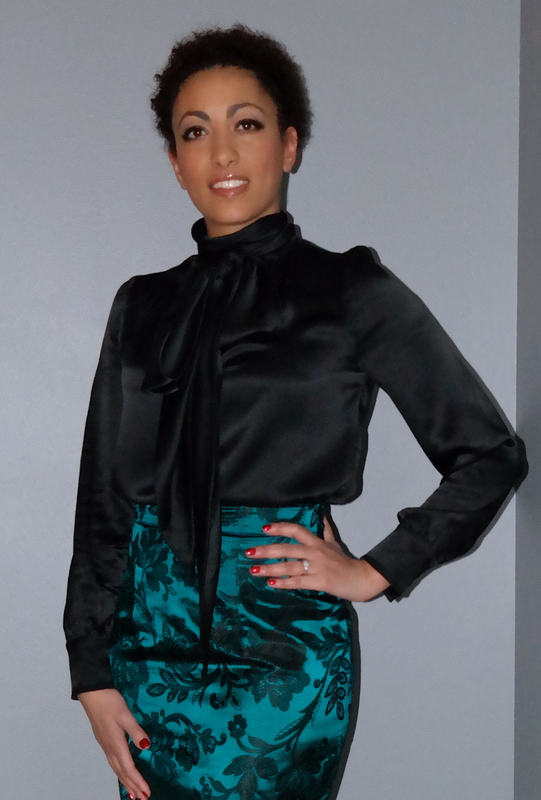 Here is the finished blouse both on me and my dress form. 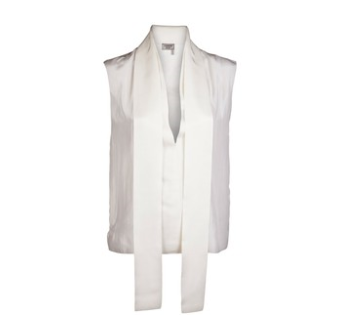 It can be worn as a loose tie or tied in a bow, and can be worn tucked in to a pant or skirt or left untucked. 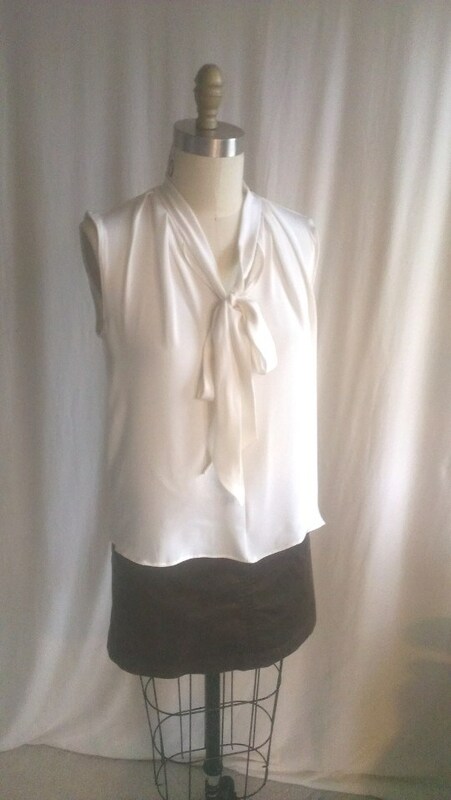 I can see this luxe little top sewn up in other pretty solid colors, sheers and prints, and also made in the other view of this sewing pattern without the tie.